Sandwich High Sensitivity ELISA kit for Quantitative Detection of Human MMP-3. 96wells/kit, with removable strips. There is cross-reactivity with MMP-10 approximately 2%, and no detectable cross-reactivity with other MMPs. Matrix metalloproteinase-3(MMP-3) also called stromelysin or transin, is a proteoglycanase closely related to collagenase(MMP1) with a wide range of substrate specificities. The complete primary structure for human MMP-3, which has 477 residues including a 17-residue signal peptide. MMP-3 and collagenase are 54% identical in sequence, suggesting a common origin for the evolution of the two proteinases. MMP-3 and collagenase expression are coordinately modulated in synovial fibroblast cultures. MMP-3 is a secreted metalloprotease produced predominantly by connective tissue cells. Together with other metalloproteases, it can synergistically degrade the major components of the extracellular matrix. It is capable of degrading proteoglycan, fibronectin, laminin, and type IV collagen, but not interstitial type I collagen. MMP-3 genotype may be an important determinant of vascular remodeling and age-related arterial stiffening, with the heterozygote having the optimal balance between matrix accumulation and deposition. The standard product used in this kit is recombinant human MMP-3, consisting of 460 amino acids with the molecular mass of 52KDa. The detected MMP-3 includes zymogen and active enzyme. Zhu F, Liu P, Li J, Zhang Y. Oncol Rep. 2014 May;31(5):2049-54. Doi: 10.3892/Or.2014.3060. Epub 2014 Mar 5. Eotaxin-1 Promotes Prostate Cancer Cell Invasion Via Activation Of The Ccr3-Erk Pathway And Upregulation Of Mmp-3 Expression. 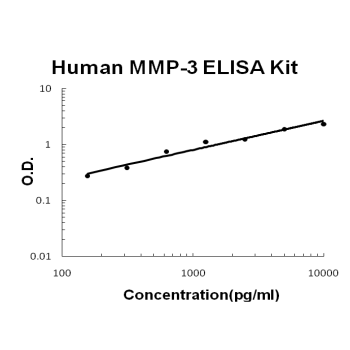 Q: Do these ELISA kits (Human MMP-2 & Human MMP-3) use the same sample diluent? What kind of chemicals are present in this diluent? A: Yes. The diluent contains NaCl, Tris, BSA and preservative.